E. D. Perry's Sanskrit Primer is not an easy book. That's because Sanskrit is not an easy language. Perry's book is based on the idea that a simplified Sanskrit is not going to help you read the non-simplified language of the classical literature. Learning about, say, "Veejay and Sunila at Home" will not help you make much progress toward understanding the Bhagavad Gita. Perry assumes that you'd just as soon start with the important writings. c) the fact that it talks to you as an adult who is serious about learning a classical language. For most of us the most important purpose for learning the language is going to be for translation: Sanskrit to English for most occasions, and English to Sanit to make sure we understand the words and constructions. As far as I'm concerned the best method is not to sluice you into Sanskrit with some invented simplified form, which is likely to lead you to a crash once you're up against serious literature, but to start out with the genuine article and establish confidence that you can master the material. Nevertheless, please do not try to read through Perry's Introduction all at once. I will refer to the relevant sections as we move along. The introduction is so packed with material that it may become impenetrable or discouraging if you try to find your way through it without my "Ariadne's Thread." My job, so to speak, will be to try to translate Perry into English for you. Devanagari is the script used to write Sanskrit. I've written Sanskrit words by hand for many years, and they've never come out as nice as I wanted them to. (For that matter, that same phenomenon applies to all my other items in hand writing.) Thus, I am glad that I can download Sanskrit fonts for free and let the computer do the hard work. You will only see empty boxes or a mess of letters and symbols if you do not download a font. My actual lessons in this course will come in pdf format, so that everyone will see the same thing, regardless of what's installed on their computers. I have had a good experience for quite a while now with Sanskrit 99. One of its most outstanding advantages is that it automatically includes its own Devanagari keyboard, which mirrors the keyboards of English/American keyboards much more closely than other fonts. 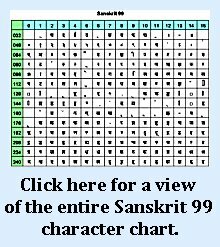 If Sanskrit 99 does not work for you, please try Sanskrit 99c or Sanskrit 99ancient. I have one student for who can't use Sanskrit 99, but he's good with Sanskrit 99c. Sanskrit 99ancient uses characters that more closely resemble those used by Perry, but when you step outside of Perry, most readings will use fonts much more like the other two. All these fonts are located at the same site. 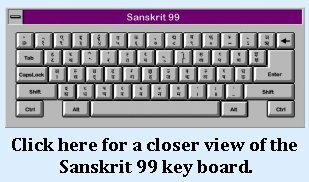 Now, one has to realize that there are many more characters needed for writing in Sanskrit than there are keys on the standard computer keyboard. So, particularly for a lot of the combination letters (explanation later), one has to go to the greater arsenal of options. For Word, click "Insert"--"Symbols," select your Devanagari font, and find the character you're looking for on the chart that comes up. The layout in your word processing program may be somewhat different. You get the same materials with the other varieties of Sanskrit 99. Theoretically, this course will not require you to use vocabulary beyond that which is contained in Perry's book, but presumably you'll want to put your Sanskrit to use as your ability grows, and then having good dictionaries available becomes indispensable. the "Harvard Kyoto" (HK) system. Follow the order of the alphabet: vowels (for each one, short before long), consonants (horizontally along the rows: guttural non-aspirant through labial vowel, or "ka" through "ma"), semivowels, sibilants, and aspirants, to find the equivalent in the Roman alphabet you need to enter so as to get results from the MW dictionary. the "Sanskrit Library" system. In addition to giving us an alphabet chart of the Roman characters, you can also click on a link to a little chart that gives you both the Devanagari letters and the Roman letters you should use for transliteration in their system. the "ITrans" system. This one seems to be the most intuitive in some ways. It does use the tilde ("~") to distinguish between various forms of the "n," while other systems substitute different letters altogether. Once you get the hang of one of the transliteration schemes, this dictionary is extremely useful. I also own and use a rather voluminous dictionary in print: V. S. Apte, The Practical Sanskrit-English Dictionary (Delhi: Motilal Banarsidas, 1978, orig. 1890). One of its strong suits is that a lot of entries come with a (sometime fairly lengthy) citation out of the classical literature, illustrating usage of the word. Remember, when you use a book-form dictionary, even if it is most likely to be used by Westerners, the words will still be ordered according to the Sanskrit alphabetic sequence. Speaking of V.S. Apte, an online version of his English to Sanskrit dictionary is accessible online, and it appear to be quite satisfactory. Whenever you use a dictionary or an online translation program, before you commit yourself to a certain translation, be sure to check it out by translating it back into English (or, better yet, into another language with which you may be familiar.). E.g., when I need to find the Sanskrit word for, say "now," I may go to Apte's English-Sanskrit dictionary and come up with the word adhuna. Then, just to make sure I didn't pick some highly unusual secondary meaning of the word, I'm going to go back to Monier-Williams, type in adhuna with a long "a" at the end (HK: adhunA) and hope that it comes back as "now." In fact it does, and so I feel free to insert it. Having a Sanskrit grammar by your side is not essential for this course, but, if you're the kind of person who is wanting to study Sanskrit to begin with, chances are you'll want to invest in a copy of W. D. Whitney, Sanskrit Grammar (Delhi: Motilal Banarsidas, 1977, orig. 1878). This is not a novel with a gripping plot; you'll want to use it as a reference book. Whitney is thorough, if I may venture an understatement. One of the assets of his books is that, although it focuses on classical Sanskrit, it points out all along where the language of the Vedas differs from later writings. Some tips to help you get off to a good start and keep you going. 1. Memorize the letters of the alphabet in their proper order, which means following the horizontal lines for the consonants. You'll see what I'm referring to fairly soon. This is the order that reference works follow. Know which ones are guttural, palatal, etc. 2. Also memorize the consonants in their columns so that you can remind yourself of which ones are sonants, ...., and nasals, as well as which ones are aspirated. Reciting these two lists can be extremely effective in putting oneself to sleep. 3. Focus on reading (aloud, if possible) the text in its Devanagari script rather than relying on transcriptions. 4. Make yourself vocabulary cards or lists to help you memorize the words backwards and forwards. You will learn by writing them out and then quizzing yourself. Please forget the idea of learning Sanskrit "by immersion." I can't say positively that there is no community where Sanskrit is the day-to-day language, but I don't know of any. The notion of adults learning a language by immersion is highly overrated for any language anyway. And now, to reach for our machete and start to clear a way through Perry's "Introduction."